Australia is officially known as the Commonwealth of Australia. It is the largest country in Oceania and includes Tasmania and some other small islands. It is the world’s sixth largest country based on land area with a land mass measuring 2,941,300 square miles (7,617,930 sq. km)..The country name was derived from the Latin Terra Australis which means “southern land.” With its southern isolated position, it is affectionately known as the land down under or the “island continent.” It could be considered a wonder itself as the world’s largest island. Australia is home to one of the 7 Natural Wonders of the World. So, what are the 7 Wonders of Australia? Here is a look at the magnificent attractions that call Australia home. What are the 7 Wonders of Australia? The Great Barrier Reef is the world’s largest coral reef located off the north-east coast of Australia. The coral reef stretches a distance of 1,400 miles (2,300 km). The reef is comprised of 2,900 individual reefs and 900 islands. The Great Barrier Reef actually covers an area of 133,00 square miles (344,400 sq. km). It is a World Heritage Site and recognized as one of the 7 Natural Wonders of the World. 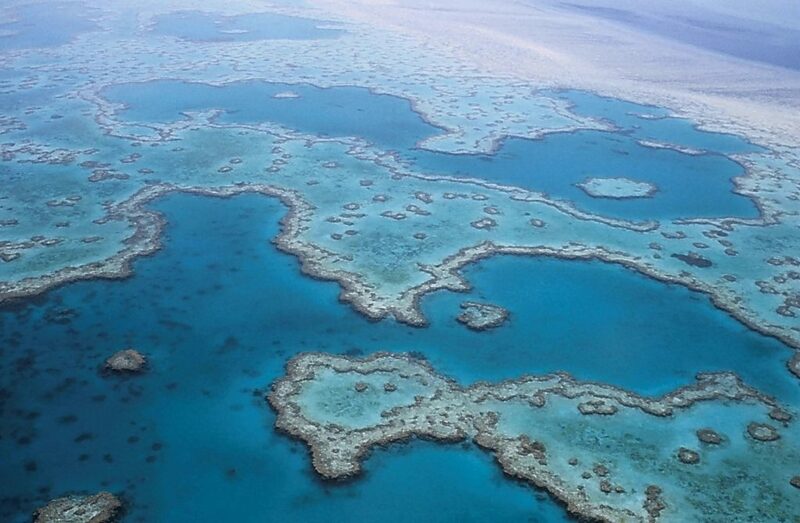 Much of the reef is protected by the Great Barrier Reef Marine Park. The Great Barrier Reef is home to 30 species of whales and dolphins, over 1,500 species of fish, 17 species of sea snakes, six species of sea turtles, 125 species of sharks and rays, around 5,000 species of mollusk, 215 species of birds, and almost 2,200 species of plants. It is one of the richest areas for wildlife and nature. The Sydney Opera House is one of the most recognized architectural structures in the world and one of the 7 Wonders of Oceania. The opera house is a multi-venue performing arts center located on the Sydney Harbor shore and near the famous Sydney Harbor Bridge. 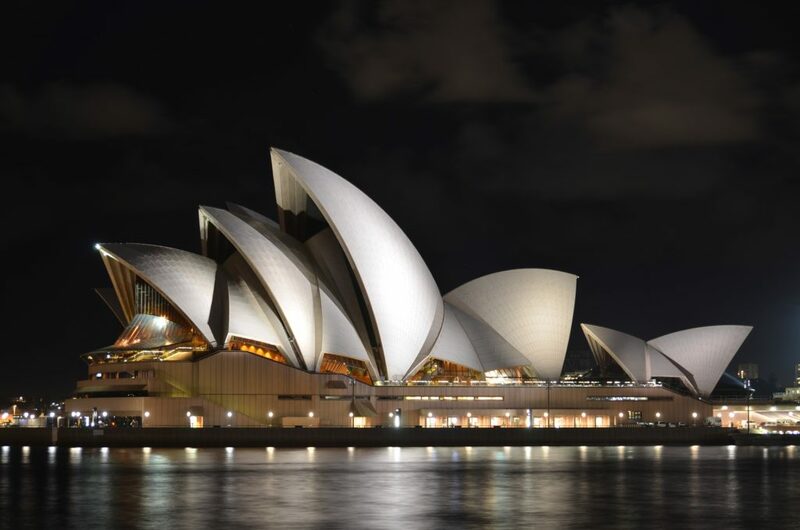 The Sydney Opera House is recognized as a UNESCO World Heritage Site. It occupies an area of 4.4 acres (1.8 ha) and the structure measures 600 feet (183 m) long and 394 feet (120 m) wide. The building is home to the Concert Hall, Joan Sutherland Theatre, Drama Theatre, Playhouse, Studio, Utzon Room, Recording Studio, and Outdoor Forecourt. The Concert Hall is the largest area accounting for 2,679 seats. It is also home to the Sydney Opera House Grand Organ which is the largest mechanical tracker action organ in the world featuring 10,000 piples. Uluru, previously named Ayers Rock was officially declared Uluru / Ayers Rock in 1993 serving as the first officially dual-named attraction. It is located in the southern area of the Northern Territory. The closest town and primary access is Alice Springs which is 280 miles (450 km) away by driving. 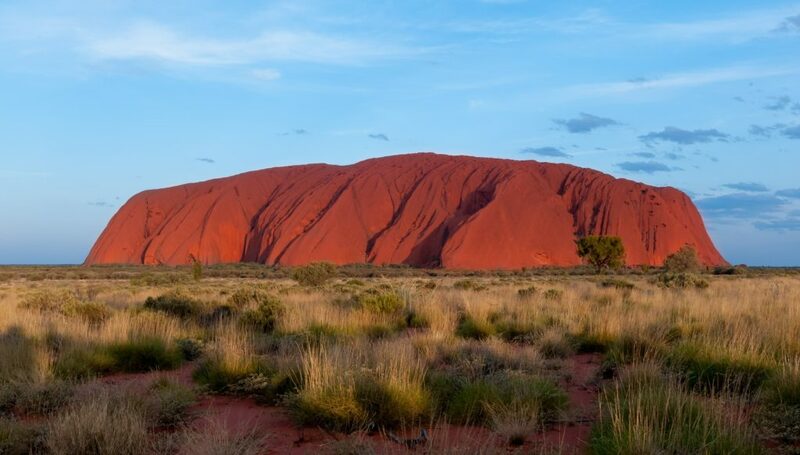 Uluru is recognized as a World Heritage Site and one of the 7 Natural Wonders of Oceania. It is an incredibly unique structure located in the middle of an ever-ending flat part of the country. It looks out of place. Uluru reaches a height of 2,831 feet (863 m) and measures 5.8 miles (9.4) around in circumference. One of the highlights of this wonder attraction is how it appears to change colors depending on how the light hits it. Uluru is comprised of a type of sandstone known as arkose.